Read about the day I crossed the Olympic finish line in Australian Times ! The theme song to Chariots of Fire plays from the speakers, pushing me on. I must keep going; I’m almost there. I can see light at the end of the long tunnel I am running through and as I come into that light, thousands of people are cheering. I can’t help but smile and it’s now I realise how incredibly lucky I am to be here. My excitement grows ten-fold as I approach the last 300 metres of my five-mile run in the new London Olympic Stadium. Despite being one of 5,000 runners chosen simply because my name was picked from a ballot, the feeling I’m experiencing is one of adrenalin, achievement and pride. This must be how the real athletes feel. Feeling, if only for a mere moment, what it must be like to cross the Olympic finish line is pretty special. I’ve just run on the very track where many talented sports people will be sprinting, urging and willing themselves across the finish line in four months’ time. In a bid to make the most of my five minutes of “athlete” glory, I can now say I beat the 2012 athletes to the punch. The run itself was a fantastic insight into the Olympic Park for me and my cheering friends, and I’m sure many others, who won’t have the chance to get near the Games during the summer. To run past the iconic venues of this year’s Olympic and Paralympic Games in what was the first staged event to be held there, made me wish I had been born with enough talent to make it to the big time. Yet even living in the host city and knowing full well that I was about to embark on a run that over 40,000 people entered to take part in, I never really felt the connection to the Olympic Games. I’ve seen the hype on the tele, of Boris’ team ‘cleaning up’ London, the unveiling of the athlete’s kit and even had a sneak peek at the Park from the Stratford Westfield after many a shopping trip there. But after actually running in front of the cheering crowds and feeling inspired by what the athletes are going to experience in front of a fully packed Stadium, I feel more excited about the Olympics now than I ever have, and probably ever will. The 2012 Games will be a great boost, not just for Aussie patriotism when our green and gold medal hopefuls land in the UK, but for British pride too – it’s inflated mine that is for sure. Look out London, Olympic fever has officially hit! 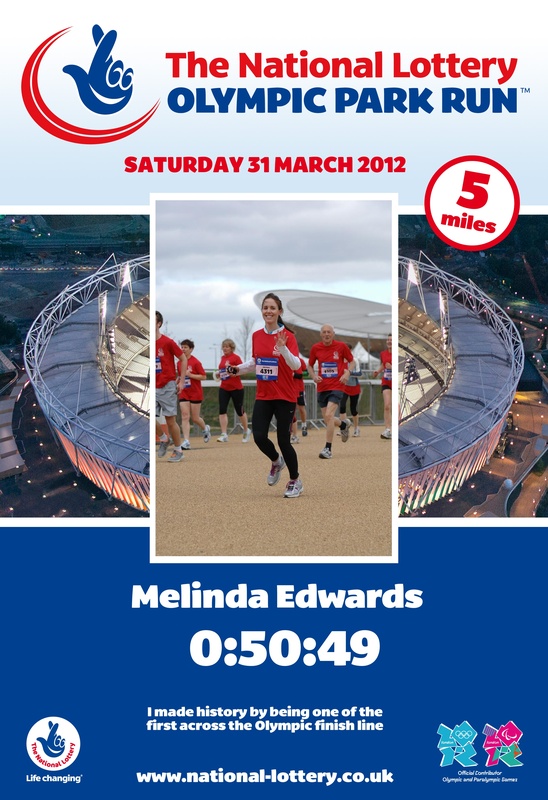 Thank you for getting me across the finishing line! The sea is cold but every muscle in my body relaxes and is soothed by the salty water and I feel elated to be in this very spot at this very moment. It took three days and 100 miles on foot, bicycle and kayak through the beautiful countryside of Somerset and Devon to get to this point in the Wild UK Adventure Challenge for The Prince’s Trust. It also took months of preparing – a challenge itself having done not much extreme activity for months before I decided to sign up in a team with my work colleagues Sarah, Olivia and Catriona. I was simply proud of myself for getting through the exercise and being able to run up to six miles in one training session, let alone completing the 100 miles for the actual challenge. I could save a lot of time for both myself and you as a reader and just say exactly how I feel about the whole challenge in four little words – it was bloody tough. But I’m going to attempt to describe exactly how tough it was, you know, so you can be sure that those sponsorship pounds didn’t go to waste! For starters, our very first challenge on the very first day was colourfully labelled as a 10 mile “hill race”. A hill race it was where we had to race the 38 other teams to the top of the highest point in Exmoor, Dunkery Beacon; time limit, two and a half hours starting near Dunster Castle on the Devon coast and making our way through small villages, forest and then eventually over the mountain to come down the other side for lunch. For extra points, we needed to collect Scavenger Hunt items like a feather, pine cone, sheep’s wool and other natural items along the way, which I feel was little more than a distraction to keep our minds off the climb we had to endure. With challenge one complete, we were then faced with a 10-15 mile navigational hike that afternoon. We were given Ordance Survey maps with a number a checkpoints, all worth varying points according to the difficulty to reach them. We started off slow, a false sense of security that we’d have plenty of time to get through but we quickly realised that after an hour of trekking and only having reached two checkpoints, we had to get moving. We moved faster, slogging through peaty mud, across farmer’s fields avoiding cow pats and sheep poo, down bridle trails and then up bridle trails, over hills, through cutesy villages, through national forest, along main roads and country lanes, dibbing into the checkpoints and then heading on our way again. We had to complete extra challenges at each checkpoint – mental challenges like word puzzles and the like, and after five hours, we made it to the first camp at Wimbleball Lake. But the trek had taken its toll on myself, my team mates and many other participants in the form of horrific blisters and sore and aching muscles. But I had trouble with my knee, which the medic put down to a damaged ligament. She prescribed, ahh… ‘rest’. Proud of our enthusiasm, determination and hard work during the day, our team was announced as sixth overall that night. We were doing well. Our wake up song on day two was U2’s Beautiful Day. Not totally inappropriate for the kind whether we woke to, but completely inappropriate for what we were about to go through. The first challenge we faced was a 3-7 mile kayak around Wimbleball Lake, followed by another 4-7 mile trek around the lake, both challenges we had to reach as many checkpoints as we could to collect as many points as we could in one and a half hours each. My knee started giving me grief again so I got it strapped for the trek, but still I hobbled along behind the three girls trying to keep up with them so we could keep our position against the other teams. But the pain wasn’t over. After a quick stop for lunch and a change into dry clothes following the wet kayak challenge, we were on our bikes, heading off for a 25-36 mile cycle from Wimbleball Lake to Thorverton, a small town in Devon. The toughest of all the challenges, we cycled down narrow country lanes and then on several off-road sections through muddy trails and streams. We were faced with 17 per cent incline hills and all the while navigating our way to checkpoints to collect points. I think we were pushing our weary selves and our bikes up the steep inclines and through the muddy bits more than we were actually cycling. I can’t remember the China challenge being this tough! But fellow participants gave us strength, particularly one guy who, while we were all walking up a massive hill, was giving out jelly babies… the sugar was a life saver. The day also came with its share of hiccups. Not forgetting the dangers of actually racing through the countryside on a bicycle, we came across a fellow challenge participant who had come off his bike, hit the bitumen and needed several stitches. And, ever so slightly dramatic, one of our own team members had a fall into a hollie bush, but thankfully the Skype team behind us stopped to help fix her bike. We repaid them in our chocolate supplies we packed for the day – a small price to pay for the gratitude we felt for them. If one of our team members could only push her bike, it would mean we’d slip further and further behind. But we still had another setback to come… after having made it to some of the most difficult checkpoints, we came in 10 minutes late at a compulsory checkpoint half way through the challenge and lost 50 points, taking away most of the hard work we just did the couple of hours previously. Demoralised, we begrudgingly trooped on and made it to camp at Thorverton by the required time of 6pm. We hadn’t lost any more points thankfully. We dropped to 10th place when the scores were announced that night at dinner. Game plan – we were determined to stay in the top 10! “Only one day left” was all I could think when we woke on the final day of the challenge to our wake up song, Final Countdown. Yes indeed, the countdown was on and we were excited to see the light at the end of the tunnel! Our last challenge was another cycle, but this time, we were making our way through a more urban environment as we were getting closer and closer to Exeter and then our final destination, Exmouth. Distance; 20-30 miles with a time limit of four and a half hours. Our bodies in pain, we got back on our bikes, this time in the rain as the weather had turned nasty on us. Today, we would have wet pants and muddy faces for the rest of the day! Again, we had to make our way to various checkpoints for the points, and just in case we weren’t quite mentally and physically exhausted enough, an extra challenge of a rock climb was thrown in half way for additional points. At last we were making our way downhill towards the sea, and after we got lost in the town of Exmouth, we finally came to the beach and saw the branded flags of the challenge in the distance. As the finishing line came into clear sight, we cycled harder and got more excited about the fact that we would be getting off our bikes and having a shower to clean the mud we collected on our faces from the rain that morning. We had made it! We dumped our bikes and jumped into the sea – cool and refreshing – and collected our medallions. I can’t remember another time that I was so glad to see the end of something. While the whole challenge was a memorable experience, I’ve completed it and won’t be going back for more. Don’t get me wrong, it will be an experience that I will always remember as it’s those things that are the most difficult that remain in your memory as something that you got through and all in good spirit. I think if I were to revisit the challenge, I would go back as a volunteer. They really did make the tough hill climbs easier with their cheering and heartfelt encouragement. I don’t think we would have made it through without them. 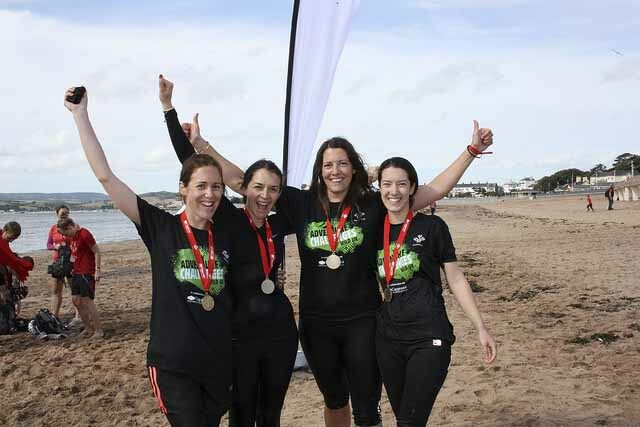 The bonds we developed as a team was also a plus – we saw the worst and best of each other and in the end we made it through together and came out 11th team overall and 2nd out of all The Prince’s Trust teams. Not bad considering we were up against mixed teams with burly men and toned women. I think we were one of two all-women teams and we didn’t do too badly we think. And let’s not forget the whole reason why we signed up for the challenge – to spread awareness about The Trust helps disadvantaged young people to get their lives back on track. It was a fantastic experience and was certainly a weekend to remember! Thanks for all your sponsorship – we made it to £1875 in total!